I heard at least one of them as soon as I stepped off of the sidewalk along the Walnut Lane Golf Course and into the woods of the Wissahickon. The problem was that I hadn't heard these trills in 9 months or so. Was it a Pine Warbler or a Chipping Sparrow? The nearby White Pines suggested Pine Warbler but the golf course also has a number of Chipping Sparrows around April each year. As I walked along the trail down to Forbidden Drive I heard the call again. I was about to give up on finding it and just continue down to the Wissahickon at Forbidden Drive, where migrants are often more plentiful. But then there was a particularly insistent call. So I stayed. And finally was rewarded with a view of my first warbler of 2008, a pine warbler! I also saw an Eastern Phoebe, in more or less the same spot where I saw my first one of 2008 a few days ago. Other birds include 10+ Common Grackles, 13 Canada Geese, far more than I normally see in this area of the Wissahickon, Reb-bellied Woodpeckers, many Robins, White-Breasted Nuthatches, Mourning Doves, Cardinals, Juncos, Carolina Chickadees, Song Sparrows and American Crows among others. 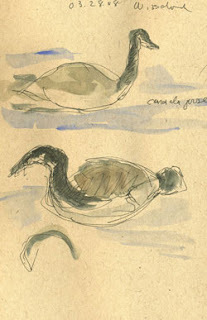 I did this small drawing of Canada Geese in the Wissahickon while on this walk. It was drawn in 30-60 seconds and I added a bit of watercolor when I got back home. It's nothing exceptional, to say the least, but it does remind me of the excitement of working from life. There is something about sketches that often seem to capture the dynamism of life. Though the best art is often considered to be that which is most developed I often find myself admiring the sketches of some artists more than their finished work. Rembrandt springs instantly to mind. I also have great admiration for the sketches of Richard Diebenkorn and Elmer Bischoff though I also love their paintings. Perhaps because their paintings also have much of the spontaneity of their drawings there doesn't seem to be such a dichotomy. This also reminds me of how much I enjoy looking at the sketches in 'Drawing Birds' by John Busby and how much more fulfilling I find them than much more finished and polished 'wildlife art.' They capture both the vitalty of the subject and something of the airy quality of being outdoors. Perhaps in another time, where I spent more time outside I would find this less valuable. But today there is something especially appealing and rewarding about art that exudes both vitality and a sense of the light and atmosphere of the outdoors. 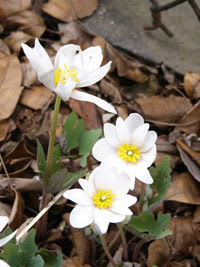 I took a short walk at the Wissahickon today hoping to see some migrants. Last Saturday my wife and I had seen our first Hermit Thrush of the spring, his head popping out of some rhododendrons, before he headed to his more usual location on the ground or on bare branches close to the ground. In the same area we had also seen a winter wren and what most likely were 1-2 Black-Capped Chickadees. Though Carolina Chickadees are far more common here I don't have much doubt that at least one of these was a Black-Capped. Today at the same location I found none of these birds remaining. There were a number of Carolina Chickadees but no Black-Cappeds. Then I saw what must be a Hermit Thrush. It was facing away from me but I noticed some strong dark streaking along his flanks. But that didn't seem consistent with a Hermit Thrush. My next thought was a Wood Thrush but this seemed impossible. It was a month too early for Wood Thrushes. Finally I noticed how really thick the streaking was and also the gray on the head. It was a Fox Sparrow, the first of 2008! I assume if I'd looked long enough I would have seen a non-thrush like bill. A bit later I came upon my first Eastern Phoebe of 2008. My wife had thought she'd seen one near same location this weekend but it had flown off before we could confirm it. Outside of the expected birds, e.g. Titmice and White-Breasted Nuthatches, the only other surprise was a large high-flying bird. This turned out to be a Great Blue Heron. He seemed to be heading North along the Wissahickon. Normally we see them in the water if we see them at all at the Wissahickon so it was a surprise to see him so high. But they present a different picture when in flight high in the air than they do on the ground. Unfortunately I wasn't quick enough to pick up my sketch pad and try to get the elegant shape down on paper. Maybe next time. 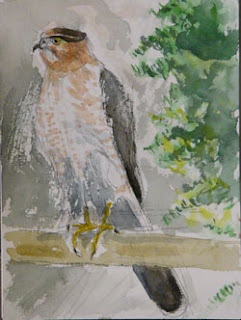 I continue to experiment with watercolor, today with a quick, small painting based on a photograph of a Cooper's Hawk that appeared in our Philadelphia backyard about a month ago. Today's experiment confirmed a couple lessons about watercolor. First, at least when working realistically, it pays to do a drawing first, to give some structure to the very fluid medium of watercolor. And second, watercolor is very dissimilar to oil/acrylic painting. Once the pristine paper has been touched it can't be brought back. In that sense it's more like wood or stone sculpture than like oil painting. It's unforgiving and once the pristine paper is gone it's gone, just as in carving wood. I learned that today when just one or two small strokes killed the painting. I had to use a palette knife to scrape back to some white surface. So why bother with it if it's so temperamental? I think for the same reason that many artists have: it is challenging; it can achieve beautiful results; it's great at emulating light and atmosphere. I took a course in Oriental Brush Painting about 30 years ago at City College of San Francisco. It took weeks of practice to even begin to set down realistic looking bamboo on paper. But there was something thrilling both in learning how to do so and in the end result. To a certain extent each stroke has to be perfect. Watercolor isn't quite that demanding, but it is similar, and similarly rewarding. This is my first drawing or painting of a hawk. I only mention that because the power of a hawk makes it much easier to take a rougher, more masculine approach to it. But I chose not to. Many of the hawks around our backyard seem to arrive on windy days and their feathers are always blowing in the wind. This gives them a delicate appearance, though this is often obviated by the claws and perhaps a song bird underneath them. There is also the delicate feather markings. So I attempted that type of approach here. I'm not thrilled with the results but it is a start.....And it seems true to both the bird and the medium.